Are the hotel transfers included in the tour price? Yes! The Khao Lak area spans approximately 30 kilometers along the coastline, so in case you wondered – the inclusion of hotel transfer in the tour price is pretty much standard with every tour by every company in the Khao Lak area. And what if i stay in Phuket, Krabi, Phang-Nga or Thai Muang? Unfortunately transfers from these destinations are not included in the standard tour price. In this case we would have to arrange a private taxi transfer for you for both ways. Prices range from 1.800,- to 2.800,- THB depending on your exact location for both ways. Next to the increased transfer price you have to consider a really early pickup time usually between 5:00 and 6:00 in the early morning. Additionally you will have to deal with the ride back to your hotel after a long and exhausting tour which can make your day starting at 5:00am in the morning and your hotel dropoff at approx 9:00pm at night. Our general recommendation: spare yourself all of these inconveniences and stay two nights in Khao Lak for the tour. Are the tours suitable for children and/or elderly people? Yes! Khao Lak is a family destination, so most tours and hotels are suitable for children and seniors. We keep our tours as family friendly as possible. Children are of the least concern, as our experience shows. During the boat rides, they often fall asleep easily due to the subtle engine vibrations and we often observed that they enjoy the motions of a boat when parents already get concerned at the same time. The only issue with children is that they require the highest levels of sun protection possible so a UV-protective shirt and lots of sunscreen are mandatory. 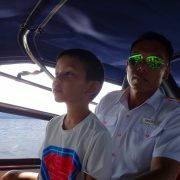 You will experience a high level of affection towards children by our boat crews as it is usual in Thailand – trying the captains chair and getting special treatment by the boat boys during snorkel stops is pretty much daily routine for us. Elderly people without physical conditions should also have no issues. If back problems, heart issues or insecurity of physical movements are present, we would recommend to stay on mainland. We are going on a speedboat ride, which is sometimes comparable to a ride in an off-road car on off-road terrain – with the difference, that if we stop the boat during the journey, the movement of the vehicle will not stop but increase. Please keep that in mind. Also official regulations don’t allow us to take persons with those medical conditions out to sea. If you are not sure, we have put together the Koh Kam tour especially for families with small children as we never leave sheltered waters on that day. Can i stay overnight on the islands? And how does it work? Generally, an overnight stay on the islands falls under the responsibility of the respective National Park office and Ranger station, so there are some limits to our ability to help you with arrangements. Yes. On the Surin Islands are several tents and some bungalows. The few bungalows are often sold out in advance. We can make a reservation under your name for a tent. You would then join our tour for the normal tour fee and at lunchtime we leave you at the rangers who will from then on take care of everything else. Any service between your drop-off and pick-up on departure day falls under National Park responsibility and has also to be paid to the rangers there directly. A tent is roughly 800,- THB per night and one meal 250,- THB. If you want to stay at a bungalow, you need to make a reservation at the respective website: http://nps.dnp.go.th/reservation.php?option=home. Since the season 2018/19 it is not allowed to stay overnight on Similan Islands anymore! On Koh Kam there are no accommodation options available for tourists, we are afraid. I have never snorkeled before - can i join your tours? I am pregnant - can i join your tours? No! Pregnant women are excluded from snorkeling tours by several laws and regulations. Also the tour insurance does not cover pregnant women, so if you join our tours and keep quiet about it – there is no insurance coverage for you whatsoever. Please don’t even try – why would you? No! ..just joking, Yes of course there is a small marine toilet on board. You will also encounter a toilet facility at our respective destination. I can not swim - can i join your tours? May we recommend the Koh Kam tour in this case then? Usually it is no problem to join the tours even if you can’t swim. But as our priorities are snorkeling instead of looking at islands at the Similans and Surins tour, we think that you have a lot better day out if you join us to Koh Kam instead. Is there vegetarian / vegan food available? One vegetarian dish is usually provided by standard – don’t be surprised if it’s fried vegetables. Vegans always struggle with the widespread use of oyster sauce in Thai cuisine – as long as oyster sauce is no problem for you, there are no issues. If you are allergic to oyster sauce or can’t eat it because you are on a strict vegan diet, we need to know in advance! Please note, that we can only fully control the menu on our Koh Kam tour, as in the Similans and Surins the food is provided by the respective National Park kitchen which we have to inform in advance. Anyways the request for vegetarian and vegan dishes is common and on the rise, so just give us a little notice. ..is not considered as “bad weather” at all. In travel season between November and May, there are frequent rainshowers – usually lasting less than 30 minutes and happen very locally. Also 90% of these rainshowers are confined to mainland and there is no rain at our destination. If you are experiencing frequent rain showers in Khao Lak during your stay, the anser is: Yes 100%, go to the islands – there is usually no rain! And you will encounter the rain again once we closing in on the mainland – a spectacular sight on some days, by the way. It gets too uncomfortable for you BEFORE it gets unsafe to operate a boat! This means, that we generally cancel trips because we know you would have a horrible day, although we could still get the boat out there and back without major troubles for us – but you are on holidays and a satisfying experience should be part of this. In this case you will get the choice of either a full refund of any payments made or rebooking on the next possible tour day. The announcement of the cancellation is usually on the day before the tour latest at 7:00 pm (19:00). If conditions change drastically overnight we also might cancel the tour in the morning, but that has not happened yet – we are pretty good at assessing weather conditions so far. In case of cancellation, you will be informed by your hotel reception as soon as they get the opportunity to do so – we will also send you an email the very minute our decision is made. Why are your tours so "expensive"? Cards on the table: our profit on those prices is around 12,-U$ / 10,- € per customer and tour. Our prices just seem to be expensive as the Khao Lak tour counter price war among the different operators take some time to ease down. Yes, you will be offered a Similan Island tour for nearly half the price when you walk around town and take a look at the hundreds of small tour counters, so why is that? In the past there were several ways for operators – especially the ones with huge boat fleets – to avoid certain costs and mandatory per-customer fees. Since 2014, the government is heavily enforcing existing laws and rules, plus the local National Parks administrations are tightening their policies towards us boat operators – a fact which we absolutely welcome and do everything to support. This is a time of transition where operators have to adapt and the selling agencies and tour counters have not yet fully learned the new meant-to-be-sustainable ways of business. In fact any sales prices below the 3.500,- THB mark is not cost effective for any sales agent and operator. That money has to be saved somewhere! So even if you are not going with us, please make sure that you don’t take the cheapest offer you can find, as that money you think you save will be deducted by lower safety and service standards or unreliable technical gear. It also means, that anyone participating on tours with dumping prices is not doing the environment and the reefs any good! What happens ..if something happens? EVACUATION TO MAINLAND – first priority is to reach mainland as quickly as possible. As our boats also serve as the local 24h emergency evacuation provider for this part of the coast, we are pretty experienced when it comes to that. All our crew members are trained in Emergency First Response procedures to provide assistance along the way. TRANSFER TO INTERNATIONAL HOSPITAL – there are several Hospitals close to the pier, but if time allows the local rescue services usually transfer tourist to one of the International Hospitals in Phuket as they offer the highest medical standards and are well equipped to handle any medical emergency case. On this leg of the transfer there is already professional Emergency Rescue staff present. ADMINISTRATIVE ISSUES – our responsibility does not stop there. Authorities (police, embassy, hospital, insurances) and relatives require information, documents and reports. Depending on the case some of this still falls into our responsibility and we are there to provide all assistance necessary. It has not happened in our operation and we work very hard that it will never happen! ..but good to know, that there is a plan just in case. Do you have spaces left for tomorrow, or..? What is the pick-up time at my Hotel? This depends on your specific Hotel. For a rough overview, check this map below where you will find your estimated pick-up time by activating the hotspot near your area. Please note, that these are estimated planning times, which change slightly on a daily basis, so you will get a final confirmation about your pick-up time upon booking. Send us an Email – email is considered to be an official and legally recognized communication method in most countries. It also offers advantages of historical organization, attachments and their content is searchable. But most important of all: E-mail traffic is legally recognized which gives both of us the security in the booking process. Receive confirmation and pay deposit – After you received your E-Voucher, it is time to pay the respective deposit (usually via paypal, but we are working on more ways of convenient and secure online payment). If you are already in Khao Lak and make a last minute booking for the upcoming days – we usually skip the deposit part and you can pay the complete tour fee on day of departure. Get picked up on tour day, pay the balance at our pier and enjoy your tour – we have arranged your pickup with the transfer company and your hotel. If you don’t hear anything from us or your hotel reception, you will be picked up in the morning and transferred to the pier, where we manage everything else. For online deposits we prefer paypal. Although ancient bank transfer is possible, it is expensive and due to the Thai banking system it is a bit tricky to identify a certain transfer and track it to a certain booking. Best solution, for both of us, would be cash because there is the lowest amount of conversion fees involved. Did you know that you get the best exchange rates by exchanging foreign currencies directly in Khao Lak? 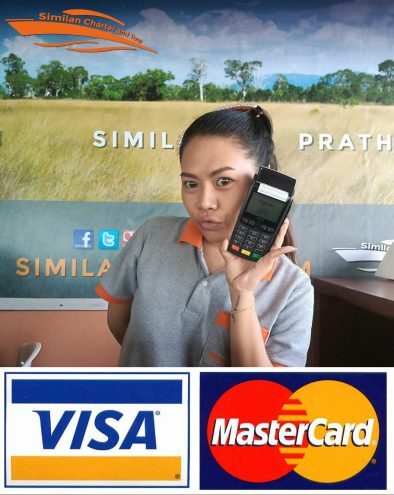 But of course, we also offer mobile credit card payment at the check-in point on our pier for you. For paypal and credit card payment, the common 3% surcharge applies. How do i cancel an already booked tour? Usually: the same way you booked it! But there are, of course exceptions – if you need to cancel a tour on short notice it is also recommended, that you let your hotel know. We are in constant communication with the hotels about the transfers, so your reception can always help you in any of those organizational matters. Cancellations within 24hours of tour departure require payment of 50% of the tour price! Remember that we have to organize spaces and transfers for all our booked guests, so the earlier you cancel, the better for everybody. If you cancel early on on the day before your tour, we often don’t enforce the 50% payment as there is plenty of time to refill this space for us and re-arrange the transfers. If you tell the driver in the morning of your tour day, that you can’t join the tour we will go after these 50% as we already have spent money on the arrangements made for you. Is there a difference on the reason of cancellations? No. The 24hour cancellation fee is for the coverage of costs that we have already spent for the arrangements. These do not change just because somebody has a serious and absolutely valid reason. Unfortunately in this case the reason of cancellation does not matter to our operation costs caused by that booking.